There are times when you need to provide permissions to an email folder to a colleague. If you are looking to grant permissions to your whole account, use these instructions instead: Office 365 - Manage Full Mailbox, Send As, and Send on Behalf of Permissions. For a complete list of email permissions in Office 365, please see Office 365 - Mail and Calendar folder permission levels. Note: Managing permissions on a mobile device cannot be performed. Use the "Outlook on the web" instructions below to manage your permissions. Note: The image used above is from Outlook on the web but the same permissions exists for Outlook. Review Office 365 - Mail and Calendar folder permission levels for definition of each permission level. In the example below, Bucky is managing permissions to his "Air_Gun" folder. Select Outlook from the list of available apps. Select Permissions... from the drop-down menu. Click the + icon in the top left of the permissions menu. Enter the email address of the person you want to give permissions to and click Add. Select their name from the list, and place a check mark within the 'Folder visible' box and click OK. Since "Air_Gun" folder is a sub-folder of "Bucky_Bash" folder, 'Folder visible' permissions must be granted to "Bucky_Bash" folder. 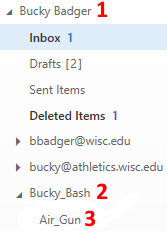 Repeat steps 3-7 for "Bucky_Bash" folder [denoted by a "2" in the image]. Lastly, assign the required permissions to the "Air_Gun" folder [denoted by a "3" in the image]. Right-click on the "Air_Gun" folder and select Permissions... from the drop-down menu. Select their name from the list, and choose the desired permission level from the "Permission level" select box. Note: When you select a permission level, the appropriate permissions are assigned (checked) below this selection. To remove the permissions from the "Air_Gun" folder [denoted by a "3" in the image], right-click on the "Air_Gun" folder and select Permissions... from the drop-down menu. Select their name from the list and click the TRASH icon located in the top left of the menu. Make sure you are on the 'Permissions' tab. On the properties screen, make sure their name is selected, then place a check mark within the "Folder visible" box and click OK. If the folder you are granting permissions to is a sub-folder of another folder, you must grant "Folder visible" permissions to each folder for this user - do this by repeating the steps 3-10 for each sub-folder. Next, right-click on the desired folder you wish to provide permissions for from the folder list and select Properties... from the drop-down menu. Right-click on the specific folder you wish to remove the individual's permissions from, and select Properties... from the drop-down menu. Select their name from the list and click the Remove button. Right-Click the mailbox folder you wish to share. Select Sharing Permissions... from the drop-down menu. Ensure you are on the permissions tab. In the search bar type the users' email address and select their name once it appears. From within the "Folder Properties" screen, make sure the user is selected and assign folder visible permissions. Right-Click the desired folder or sub-folder you wish to be shared and choose Sharing Permissions... from the sub-menu. From within the "Folder Properties" screen, make sure the user is selected and assign the desired permissions. Notify the person you granted permissions so that they now have access to the specific folder.